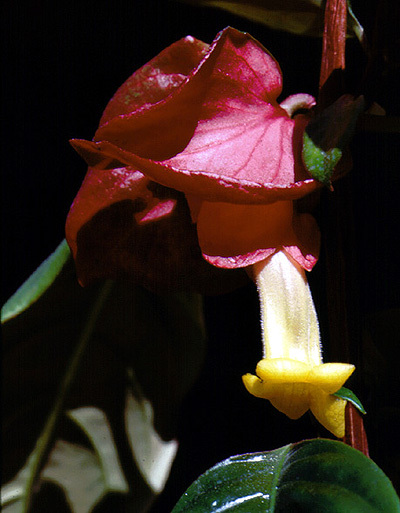 The special nature of the gesneriaceous inflorescence has been recognized only recently. It is important to note that the main axis of the plant never ends in a terminal flower (it is “indeterminate”) and all (partial) inflorescences are lateral (= axillary = emerging from the axils of foliage leaves or bracts). These lateral inflorescences represent a special type of flowering axis or cyme, the “pair-flowered cyme” (Weber 1973, 1982, 1995, 2004, 2013). By reduction, these may proceed to solitary flowers. The pair-flowered cyme is found only in three families of the order Lamiales: (1) Calceolariaceae (all genera), (2) Gesneriaceae (almost all genera, including Sanango), and (3) Plantaginaceae (all genera having non-racemose inflorescences, that is Russelieae: Russelia, Tetranema; Cheloneae: Keckiella, Nothochelone, Pennellianthus, Penstemon) (Weber 2013). In this cyme the terminal flower (T) of each cyme unit is associated with an additional flower in frontal position (front-flower, F). So each cyme unit seems to end in a flower pair. In general, the front-flower has no subtending bracteole (but usually present in the Plantaginaceae-Cheloneae), while the lateral flowers are usually subtended by bracteoles (small-sized prophylls of the successive cyme units). The development of the pair-flowered cyme has been studied by SEM in Sinningia macropoda, a species in which the front-flower is subtended by a subtending bracteole (γ-bracteole) (Weber 1995). Though the lateral prophylls (α-, β-bracteoles) and their axillary flower primordia are formed prior to the front-flower and its subtending bracteole (γ), the front-flower develops precociously and opens earlier (next to the terminal flower) than the lateral flowers. There is considerable variation in branching and flower number within the pair-flowered cyme of Gesneriaceae. 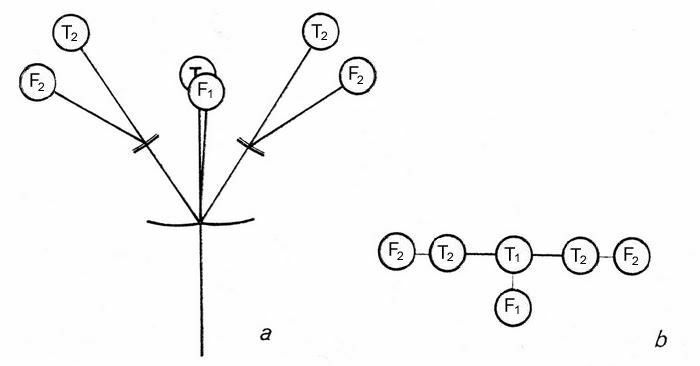 Usually, the first (basal) branching is bilateral (“dichotomous”), but there are many cases in which branching is consistently unilateral (e.g. in all members of Epithematoid Gesneriaceae). The number of flowers (or flower pairs) within the cyme may be high (e.g. unifoliate species of Streptocarpus), moderate or low. In cases of extreme reduction only the first flower (T1) remains. “Solitary” flowers occurring in the leaf axils of many neotropical gesneriads always means reduction of an original pair-flowered cyme to a single flower. If additionally the subtending leaf of the flower is reduced to a bract, the flowers of the whole inflorescence region aggregate to a raceme (e.g. Diastema, Smithiantha, Gloxinia). Occasionally, a spike is reached by extreme shortening of the pedicels (e.g. Sinningia allagophylla). 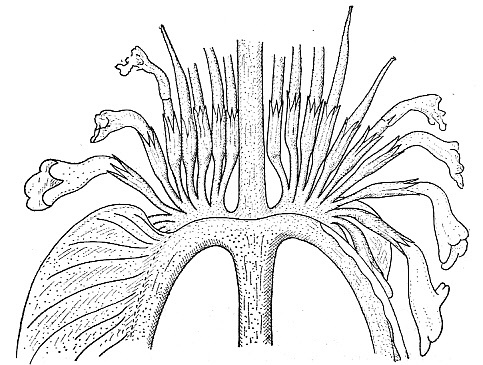 The “bracteoles” are the bracts within the cyme, subtending the successive cyme units. They encase each flower pair within the pair-flowered cyme and are usually small and inconspicuous, or may be completely reduced (in contrast, the “bracts” are the leafy structures that subtend the cymes as a whole). However, by enlargement and bright coloration bracteoles may take part in the attraction system for pollinators (e.g. Drymonia species). By the enlargement and fusion of the first bracteole pair, a conspicuous cupule embracing the flowers is formed in some species of Cyrtandra (e.g. C. cupulata, C. burbidgei). In the pair-flowered cymes of Drymonia coccinea the large wine-red bracteoles form a colourful constrast to the yellow flowers and enhance the attraction effect for bird pollinators. By serial repetition, often more than one cyme (or solitary flower) can be present in a leaf axil. Particulary remarkable are the “crested” inflorescences of some species of Microchirita: here the pair-flowered cymes are reduced to flower pairs (T1, F1) and such pairs are produced in considerable number in a line on the petiole of the subtending leaf (Weber 1975b, as Chirita sect. Microchirita, now genus Microchirita). Microchirita micromusa and allies produce uniserial “crests” of flower pairs in the leaf axils and petiole base (from Weber 1975b).